Bucknell University and WVIA present a special television presentation of ‘An Evening with Common,’ the Academy Award®-winning hip-hop recording artist, actor and activist on Tuesday, March 31 at 7 p.m. on WVIA TV. This special television presentation will be recorded at Bucknell University on Tuesday, March 24, 2015 in the Weis Center for the Performing Arts. During “An Evening with Common," he discusses a range of topics including race relations in the United States and his efforts to bring about change by empowering underserved children. Common rose to prominence as one of hip-hop's most poetic and respected lyricists. The two-time Grammy Award winner most recently won a Golden Globe Award® for Best Song and an Academy Award® for Best Original Song for "Glory" from the 2014 film Selma, in which he co-starred as 1960s Civil Rights Movement leader James Bevel. His other acting credits include his role as freed slave Elam Ferguson in the AMC historical drama series Hell on Wheels. Common has appeared in numerous films and narrated the award-winning documentary Bouncing Cats, about one man's efforts to improve the lives of children in Uganda through hip-hop/b-boy culture. An author, Common has written three children's books — one of which, I Like You But I Love Me, was nominated for an NAACP Image Award — and his memoir, One Day It'll All Make Sense, explores his upbringing and familial relationships. In 2007, Common launched the Common Ground Foundation, which provides opportunities for youth to learn new skills, as well as a support system that fosters personal growth and empowerment. "I started the Common Ground Foundation because I wanted to help. Most of all help people to help themselves," he wrote on the foundation's website. "I always believed that if we started with the youth then we would be planting the seeds for our future to blossom. Give the children a sense of hope, self-esteem, and love that will better the world." 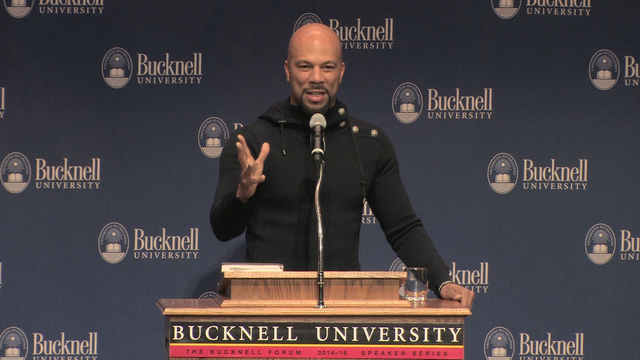 Common is the third speaker in the Bucknell Forum series Revolution Redefined, which explore social change and how it has — or has not — evolved over time, as well as how individuals can grow to become global citizens who make meaningful, lasting impacts on society in a variety of ways.